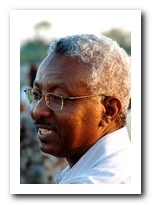 – Abdelbagi Ismail, Plant Physiologist and Principal Scientist, International Rice Research Institute. Today, we talk to Abdel. His riveting voyage in plant science starts on the bountiful banks of the Nile, before we sail on to Asia’s ricelands. We’ll make a short stopover in USA for cowpeas and drought in between, then proceed to to our main meal of rice, spiced and seasoned with a strong dash of salt-and-P.
It’s not just about food, but also family: you’ll get to meet a sister Challenge Programme along the way. Intrigued? We hope so, so please do read on! From a tender age, Abdel was fascinated by agriculture. Growing up on a small family farm backing onto the banks of the Nile in the Northern State of Sudan, he helped his parents in tilling the land, sowing and harvesting. Armed with a Bachelor’s and Master’s in Agricultural Sciences (agronomy, crop production, water relations) from the University of Khartoum, Sudan, Abdel moved to the University of California, Riverside, USA, for a PhD on drought tolerance in cowpeas. For this native son of the Nile, this move was a watershed. It marked the start of a dedicated – and still ongoing – career quest to understand how plants can adapt to better tolerate extreme environmental stresses such as higher and lower temperatures, too much or too little water, salinity, and nutrient imbalances. From time immemorial, the communities around the Nile where Abdel spent his childhood are a prime example of this flourishing against adversity. 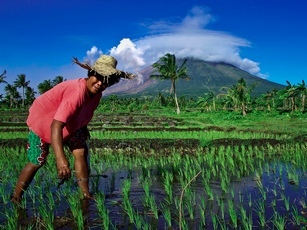 In 2000, Abdel accepted a position at the International Rice Research Institute (IRRI) in The Philippines. Abdel inspects cyclone-damaged rice in Isladi Village, southern Bangladesh. “I saw it as an opportunity to convert knowledge and scientific discoveries into resources that could help needy farmers,” explains Abdel. Abdel confesses that when he joined IRRI, his intention was to stay for a short stint and then move on. But as he became more involved in his work, he felt IRRI offered him the best opportunity to build his career, and to contribute to global food-security issues. 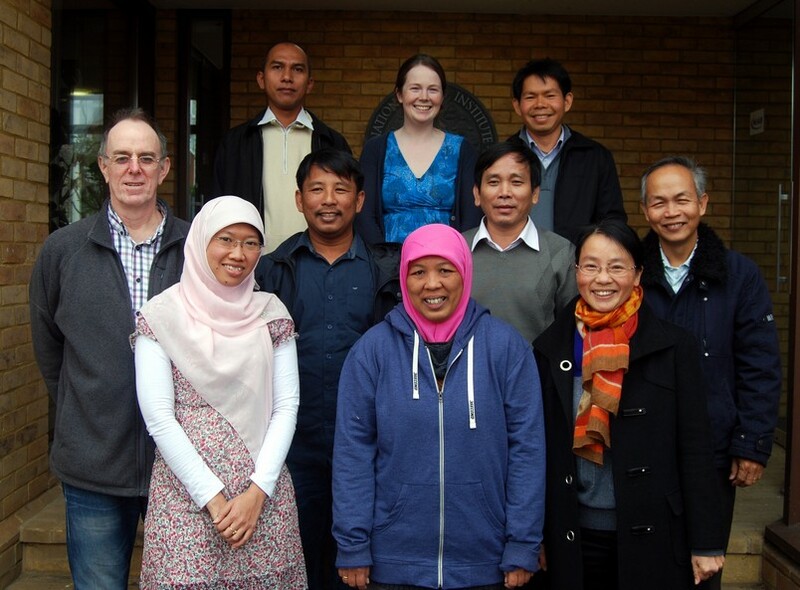 In 2004, Abdel proposed a collaborative project between nine different research organisations, across seven countries, to improve salt tolerance and phosphorus uptake efficiency in rice. 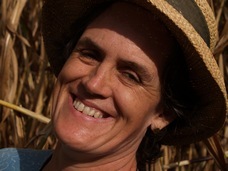 The work was funded by a sister CGIAR Challenge Programme on Water and Food (CPWF). This work caught – and held – GCP’s attention, because it sought to overcome a problem that negatively affects the lives of tens of thousands of rice growers around the world. 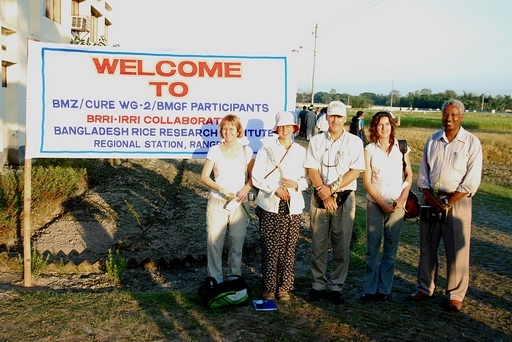 The two resultant GCP-funded IRRI-led projects involved partners from Bangladesh, India, Indonesia, Vietnam and USA’s University of California, Davis. 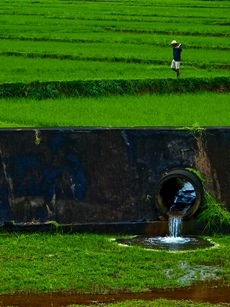 Globally, more than 15 million hectares of ricelands are saline, and more than one-third of all ricelands are phosphorus-deficient, hitting poor communities hardest. 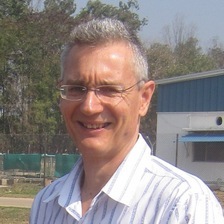 In the nine years since, and together with his colleagues and partners, Abdel has developed the proposal into a productive and coherent suite of interconnected projects: he has managed and overseen most of the progress made during the discovery of the genes associated with salinity tolerance (Saltol) and phosphorus uptake (Pup1), and their insertion into well-known rice varieties that farmers in Bangladesh, Indonesia and The Philippines know and trust. It’s all about rice: salt tolerance (Saltol) ‘meets’ phosphorus uptake (Pup1) in Bangladesh. Abdel is on the extreme right. Next to him is Sigrid Heuer, Principal Investigator of the ‘Pup1’ work. A long-term horizon helps, since, just like art, science cannot be hurried: “Having GCP provide ongoing funding and support for public institutions to conduct a long-term project has been pivotal to the success of the project,” Abdel emphasises. For Abdel, such achievements are heartening as they provide farmers with greater food and income security, which in turn improves their and their community’s livelihoods. “It brings a smile to my face whenever I think about how our work helps to produce higher-yielding crops for poverty-stricken countries whose farmers often can only afford to grow one crop per year,” says Abdel sincerely. 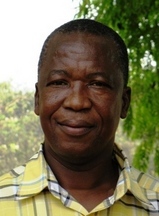 Having discovered the Saltol gene and developed experimental lines, his team is now training breeders from country breeding programmes on how they can successfully breed for salt tolerance and tolerance of other abiotic stresses using their own popular varieties, thereby fortifying popular varieties with these much-needed tolerance traits. 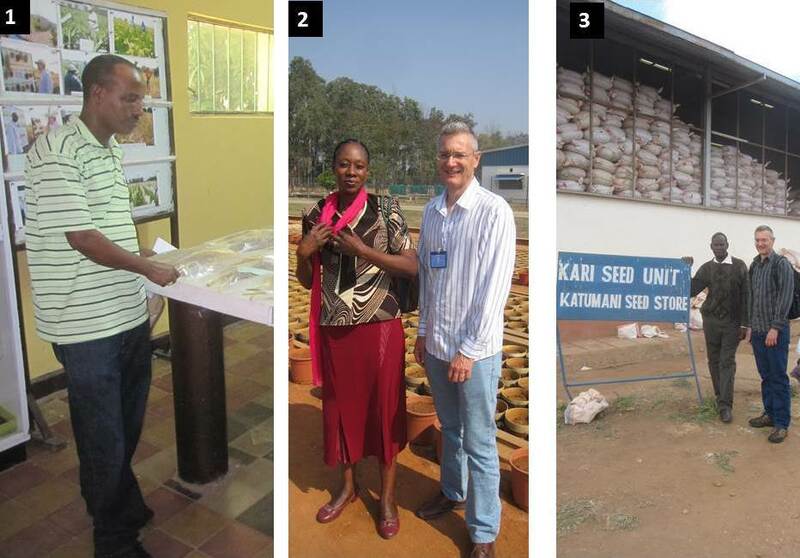 As for his other projects with IRRI, Abdel continues to build upon, and has even employed, partners he has met through the GCP project to help him with his Stress tolerant rice for Africa and South Asia (STRASA) project. STRASA is almost five years old and has another five years left to run. 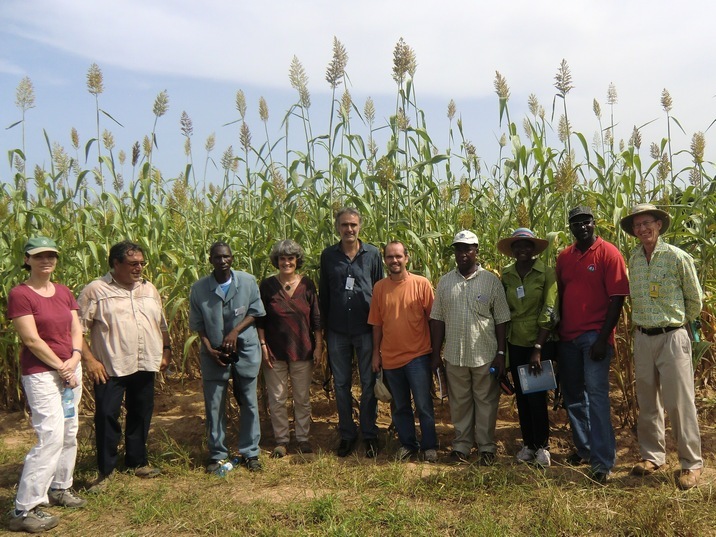 “GCP helped IRRI to attract additional support from other funders, such as the Bill & Melinda Gates Foundation, to start STRASA, which seeks to support the development and distribution of stress-tolerant varieties in Africa and South Asia,” Abdel explains. India is the world’s largest producer and consumer of chickpea, accounting for more than a third (66 percent) of world production. The Indian Agricultural Research Institute (IARI) and the Indian Institute of Pulses Research (IIPR) are collaborating with the International Crops Research Institute for the Semi-Arid Tropics (ICRISAT) on marker-assisted backcrossing (MABC), to improve chickpeas for drought tolerance. This complementary activity in the Tropical Legumes I project (TLI) Phase II is being funded by the Department of Biotechnology, Government of India. “Through GCP, we have benefitted from training in molecular breeding. The benefits of this go beyond this project,” he adds. The Indian scientists are using MABC as well as marker-assisted recurrent selection (MARS) in Phase II, applying genomic resources that came from Phase I of the project. It’s all about water and weakness – or strength. The Greek legend has it that Achilles was dipped into River Styx by his mother, Thetis, in order to make him invulnerable. His heel wasn’t covered by the water and he later died of the wound from an arrow that struck his heel. 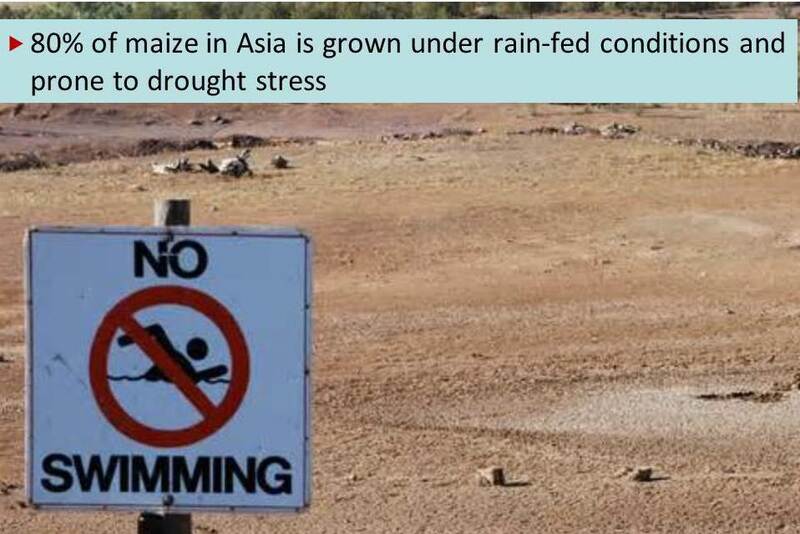 In our times, this analogy can be applied to chickpeas, where this streetwise tough customer in the crop kingdom that thrives on the most rugged terrains is hamstrung if there is no rain at the critical grain-filling period – its sole Achilles’ heel, when it cannot take the searing heat in the drylands it otherwise thrives in. Who’s now calling the shots in chickpea research? 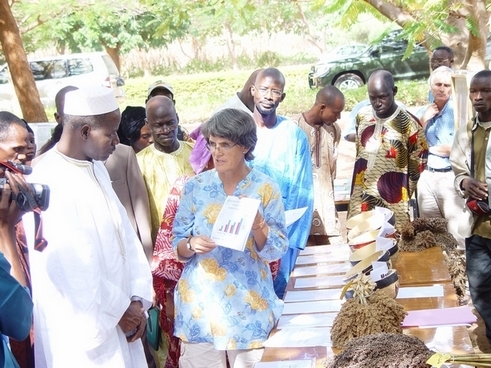 Molecular breeding in Phase I was led by ICRISAT, with country partners in a supporting role. In Phase II, activities are being led by country partners, which also assures sustainability and continuity of the work. ICRISAT is now in a facilitating role, providing training and data, while the research work is now in the hands of country partners.” – Pooran Gaur, Principal Scientist: Chickpea Breeding, ICRISAT. Chickpeas are an ancient crop that was first domesticated in central and western Asia. Today, this crop is cultivated in 40 countries and is second only to common beans as the food legume most widely grown by smallholders. The two main types of chickpeas – desi and kabuli – are valuable for both subsistence and cash. “Chickpeas are well-known to be drought-tolerant,” says Rajeev K Varshney, Principal Investigator of the project to improve chickpeas work in the Tropical Legumes I Project (TLI). 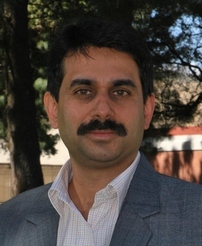 He explains, “The plants are very efficient in using water and possess roots that seek out residual moisture in deeper soil layers.” However, he points out that, with changing climatic conditions, especially in drier areas, terminal drought – when rain does not fall during grain-filling – is the crop’s Achilles’ heel, and principal production constraint. “Chickpeas are such tough plants that, even for conditions of terminal drought, yields can be increased by improving root characteristics and water-use efficiency,” says Rajeev. The research team has identified several lines with superior traits such as drought tolerance, after screening a set of 300 diverse lines selected based on molecular diversity of large germplasm collections. The team went on to develop genomic resources such as molecular markers. 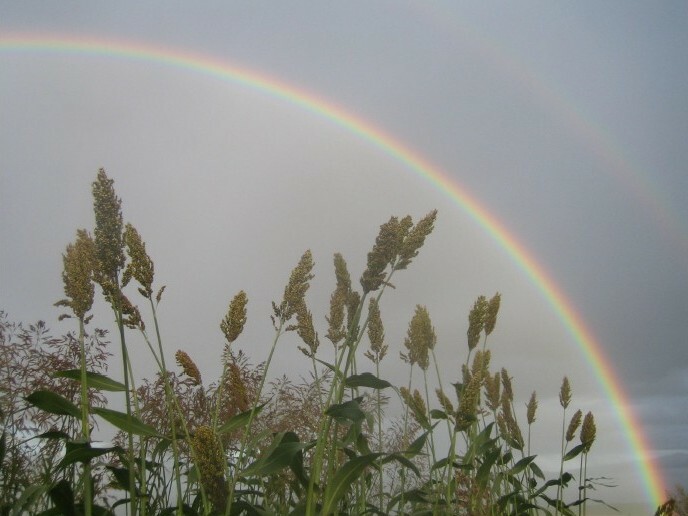 With these markers, the team developed a high-density genetic map, and identified a genomic region containing several quantitative trait loci (QTLs), conferring drought tolerance. “QTLs help pinpoint, more specifically, the location of genes that govern particular traits like root length” explains Rajeev. Longer roots will naturally give the plants a deeper reach into the water table. Root length is the difference between survival and perishing, which is why trees will be left standing on a landscape otherwise laid bare by prolonged drought. The discovery of QTLs makes identifying tolerant plants not only easier, but also cheaper and faster. “This means that better-adapted varieties will reach farmers faster, improving food security,” says Rajeev. 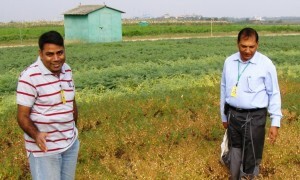 Putting chickpeas to the test: Rajeev Varshney (left) and Pooran Gaur (right) inspecting a chickpea field trial. What was achieved in Phase I, and what outcomes are expected? 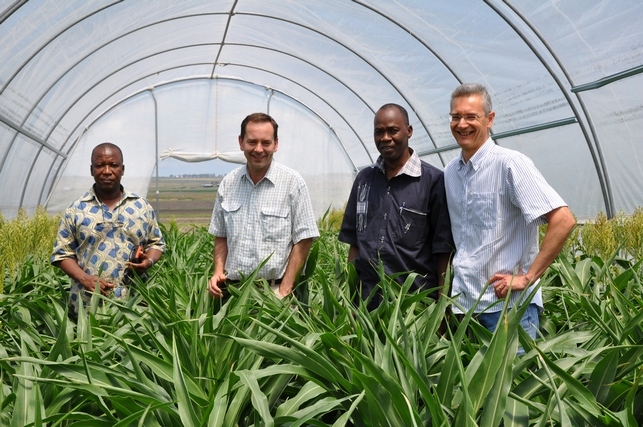 Phase I run from mid-2007 to mid-2010, during which time 10 superior lines for improved drought tolerance and insect resistance were identified for Ethiopia, Kenya and India. As well, a total of 1,600 SSR markers and 768 SNPs on GoldenGate assays were developed, along with an expanded DArT array with more than 15,000 features. A high-density reference genetic map and two intraspecific genetic maps were developed. “We now have materials from marker-assisted backcrossing by using the genomic resources we produced in Phase I. These materials were sent to partners last year . And because in most cases we have the same people working in TLI as in TLII, this material is being simultaneously evaluated across six to seven locations by all TLI and TLII partners,” says Pooran. “Preliminary analysis of data is quite encouraging and it seems that we will have drought-tolerant lines soon,” adds Rajeev. In Phase II, 1,500 SNPs on cost-effective KASPar assays have been developed that have been useful to develop a denser genetic map. In collaboration with University of California–Davis (USA) and the National Institute of Plant Genome Research (India), a physical map has been developed that will help to isolate the genes underlying the QTL region for drought tolerance. 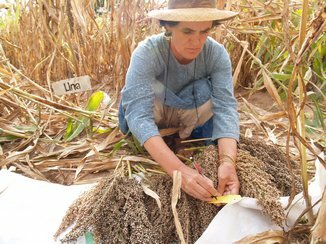 A novel molecular breeding approach called marker-assisted recurrent selection (MARS) has been adopted. Over the remaining two years of Phase II, the chickpea work will focus on developing chickpea populations with superior genotypes for drought tolerance through MABC and MARS. “Another important activity in Phase II is development of multi-parents advanced generation intercross (MAGIC) population that will help generation of genetic populations with enhanced genetic diversity,” says Rajeev. The chickpea work is led by the International Crops Research Institute for the Semi-Arid Tropics (ICRISAT), working with partners at the Ethiopian Institute of Agricultural Research, Egerton University in Kenya, and the Indian Agricultural Research Institute. Additional collaborators in Phase I included the University of California–Davis (USA), the National Center for Genome Resources (USA) and DArT P/L (Australia). For more information on the overall work in chickpeas, please contact Rajeev K Varshney, Principal Investigator of the chickpea work.